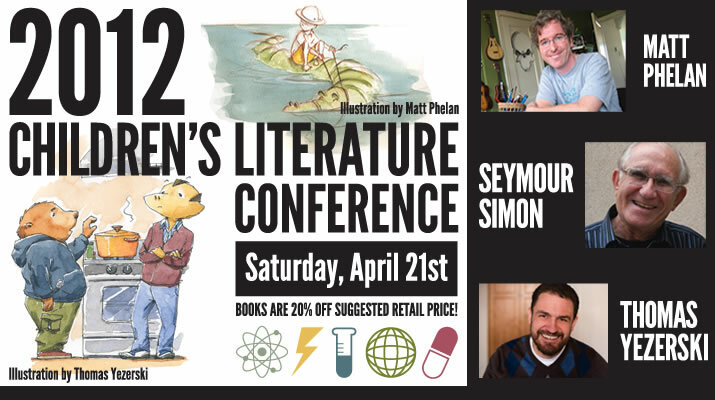 Matt Phelan is coming to Kutztown this weekend for the 2012 Children’s Literature Conference. Even if you can’t make the conference you might go to the KU bookstore to pick up his books at a discount. 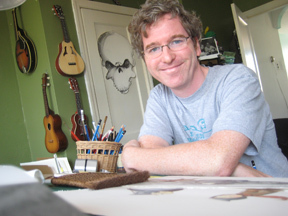 He is a prolific and popular illustrator. He writes as well. 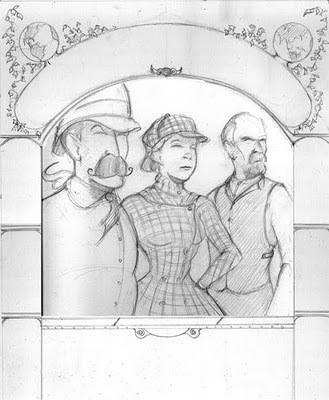 A piece of Matt’s original artwork from his award-winning graphic novel, A Storm in the Barn, was in the Dornish collection show last year at KU’s Miller Gallery. I emailed him five questions and here are his replies. 1. Do you recall an author or illustrator visit your elementary school when you were a kid? Matt Phelan: I don’t recall anything that remotely cool happening at school. I don’t think author visits were a thing back then. It’s a shame because Lloyd Alexander (author of the Chronicles of Prydain and many other books I loved) lived in my town and might have been open to a school visit. Many years later, I ran events at a Borders store and I would invite illustrators in for signings mostly so I could ask them questions. 2. Are more children’s books headed in the graphic novel direction, like your recent Around the World? Matt Phelan: The children’s publishing industry is definitely interested in putting out more graphic novels for kids. The great thing is, like all of children’s publishing, they are open to many different kinds of graphic novels. So there’s room for superheroes, talking mice, and creepy historical fiction set in the Dust Bowl. 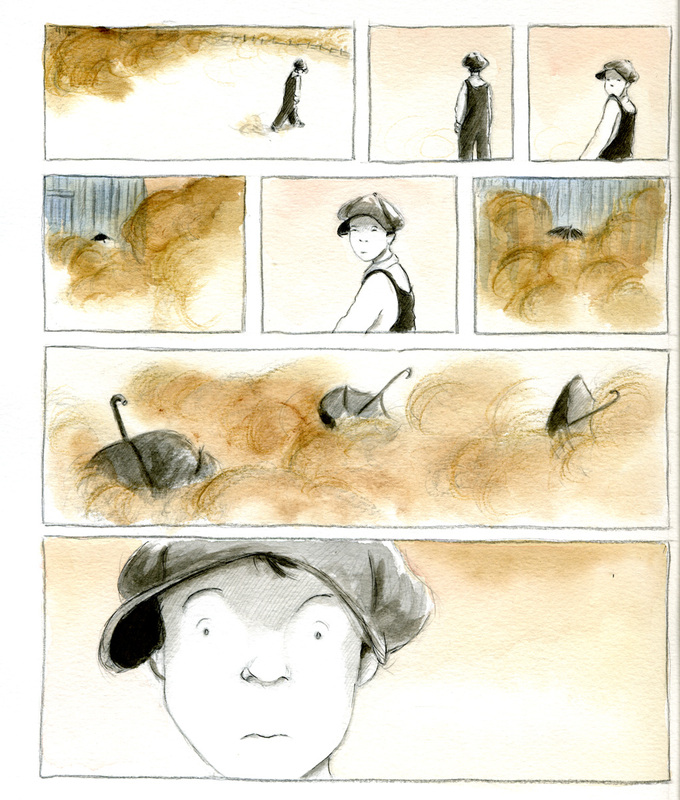 I believe there will be more picture book illustrators like me trying graphic novels in the near future. It’s already happening with people like Dan Santat (“Sidekicks”), Jarrett Krosoczka (“Lunch Lady”), and multiple Newbery Honor-winning author Jennifer Holm (“Babymouse”) putting out fantastic graphic novels for kids. Eric Wight came from comics and animation and is now creating a hybrid of prose and comics for his Frankie Pickle young reader series. Innovations like that and the variety of stories makes me think that children’s publishing is the most exciting place for comics today. 3. Any advice for aspiring illustrators? Matt Phelan: The only thing you have compete control over at the beginning is your portfolio. And that’s really the one thing that will get you work. Before you worry about mailings, contacts, or any of that marketing stuff, concentrate on making the strongest portfolio you can. Other than that, I recommend that illustrators take an acting class or two or at least read some books on acting. I studied acting in college and it has proven to be the most useful training I’ve had for my work. "Niles" watercolor © by Matt Phelan from his blog. 4. 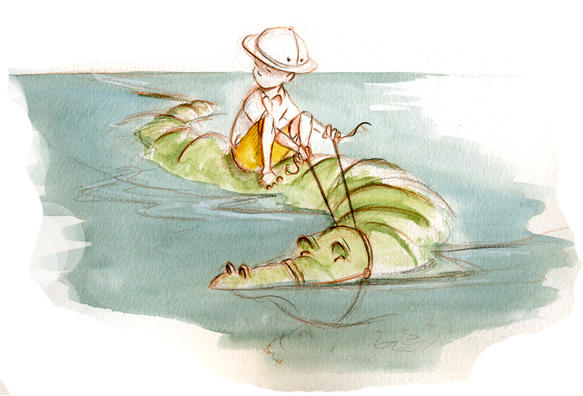 Often students say they met/know someone who has written a kid’s book and wants illustration. I give them the standard warning that publishers prefer “unencumbered projects.” What do you think, are they better off coming up with their own original story? Matt Phelan: Publishers do not want to see illustrations in manuscript submissions unless the author and illustrator are the same person. If you want to write, then submit a sketch dummy of a book you have also written. If you want to illustrate other people’s books, then all you need is a strong portfolio. I’d say that illustrating someone’s unsold manuscript (even if they offer to pay you) is time that could be better spent elsewhere. 5. Have you been to Ireland? or taken a trip abroad that’s influenced your art? Matt Phelan: I actually went to Ireland on my honeymoon, Why do you ask? Does my work seem Irish? At any rate, I always bring plenty of sketchbooks on vacation. I think everything has potential to influence your work at some point. The important thing is to be open and observe as much as you can. Sketching forces you to slow down and notice. (I’ve included some Ireland sketches of one of the many walls of the Aran Islands and some sheep in County Galway.) I have taken some research trips for my work. I spent a week in Muskegon, Michigan which is the setting for my next graphic novel. Sadly, I didn’t have the time to circle the globe for Around the World. A missed opportunity there, I think. Notes: I asked about Ireland out of curiosity after finding a web page where Matt explains the pronunciation of his Irish surname. If you haven’t read any of Matt’s work, I especially recommend Around the World. 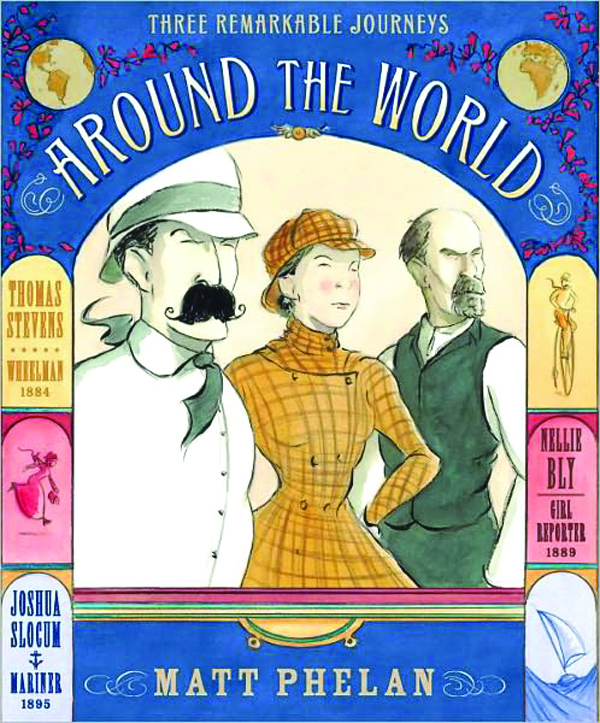 It graphically recounts three true stories of round-the-world voyages, by the reporter Nellie Bly, sailor Joshua Slocum, and bicyclist Thomas Stevens. It is like getting three good books for the price of one! More of Matt Phelan’s entertaining thoughts and lively sketches can be found on his own blog – planetham. Next > Dylan Rush: Best in Show: Lucky Break? Hi Gina, Thanks much for your note. I’ve never met Matt, looking forward to his visit to Kutztown. Comments don’t go up on the blog until I read & approve them; sorry for the delay.